Each April Summit Racing Equipment Atlanta Motorama turns Atlanta Motor Speedway into a haven for motorheads. The annual motoring festival brings enthusiasts of all kinds together to celebrate all things with a motor, with thousands of participants creating the experience that thousands more enjoy. One group that plays a part in making Motorama the spectacle that it is each year is the Georgia Outsiders Car Club. "For the most part we're a bunch of old guys and girls that have been in the hobby forever. Our car club has been together for 40 years," club president Dwight Neal said. Most of the club's members live in the Atlanta area but the club also includes members from other parts of Georgia. All told, the club has more than 70 members who have well over 100 cars between them, according to Neal. "We have a wide variety of cars," club member Tim Keith said. 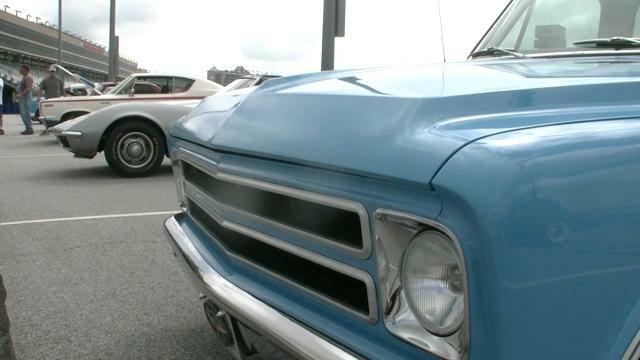 "There's everything from rat rods to street rods to muscle cars to antiques to exotics. We have a wide range of members in this club." The club meets each month; during those meetings club members discuss their cars, what modifications they're making to their vehicles, and what events the group should go to. "Of course Motorama is a big one every year," Neal said. "Just about everybody says it's the best show they've been to," added Keith. "There is such a variety of things to do during Motorama." Since 2014 Summit Racing Equipment Atlanta Motorama has been a motoring festival that truly offers something for everybody, from a spacious infield full of classic and unique rides to the vendor midway, shows, and pretty much anything else involving a motor. "I'm a swap meet guy so I look forward to the huge swap meet… to a lot of guys it's the autocross, they want to look at that, the new parts vendors, Summit Racing Equipment; they're so involved if it wasn't for them we probably wouldn't be able to have this great thing," Neal said. "And there's no end to the amount of cars. If there's something you want to see, a particular kind of car, it'll be there." When they're not enjoying everything the show has to offer, the Georgia Outsiders say sharing their passion with other enthusiasts is rewarding, too. "I have a lot of people come up and say 'I went to school in one of those when I was a kid.' 'My aunt had one of those.' 'My granddad had one of 'em,'" recalled Keith. "It makes you feel all warm and fuzzy inside." Motorama's balance between being a big show with lots of attractions while also providing those personal interactions is one of its biggest strengths, according to Neal. "This is more personalized, more, I think, family oriented," Neal said. "At Motorama you see all of the folks you want to see." "Motorama is the place to be," Keith added. The 6th annual edition of Summit Racing Equipment Atlanta Motorama takes over Atlanta Motor Speedway April 27-28, 2019. Spectator tickets are priced at $15 per day or $20 for a two-day weekend pass; kids ages 12 and under get in free! Admission includes access to all areas of the show including the vendor midway, show car garage, extreme motorsports and much more. New participants are always welcome and all participant registrations include infield vehicle admission to park in the show area, a pair of two-day tickets, FREE autocross entry, a goody bag stuffed with great gifts and offers from sponsoring partners, and an entry to win from more than $20,000 in cash and prizes as part of the Super Prize Giveaway! To buy tickets, register your ride, or inquire about becoming a vendor at Motorama 2019, visit atlantamotorama.com or call Atlanta Motor Speedway at 770-946-3919.